Finding the best kiddie pool is no easy task. You would want a pool that is entertaining, safe, as well as large enough to provide your kids with the playing room they need. We examined 14 inflatable swimming pools for kids and found 3 of them particularly interesting, although the other pools also appear to be great models. In terms of entertainment, we found Intex Rainbow Ring Inflatable Play Center and Intex Dinoland Play Center to have the most features in them. Those two pools would most likely allow your kids to have the most fun. However, what those pools can’t really do is protect your children from the sun. That task would be easy for Intex Sun Shade Inflatable Pool since it is equipped with a removable sunshade. Oftentimes, protection is more important than entertainment, so the Sun Shade Inflatable Pool is superior to the two play center pools we mentioned in the terms of safety. This doesn’t mean that only those 3 pools are worth buying. The other 11 have interesting features as well. If you want to see what they also got, then let’s proceed with our reviews. Intex Rainbow Ring Inflatable Play Center is an interesting option to entertain your kids with. 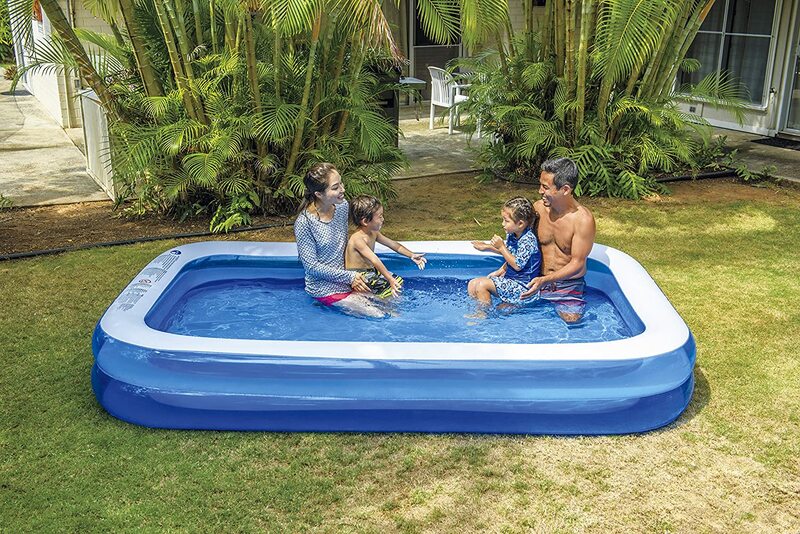 The main benefit of this inflatable kiddie pool isn’t its size but its entertainment capacity, though its size of 117 x 76 x 53 inches with 77-gallon water capacity is noteworthy as well. 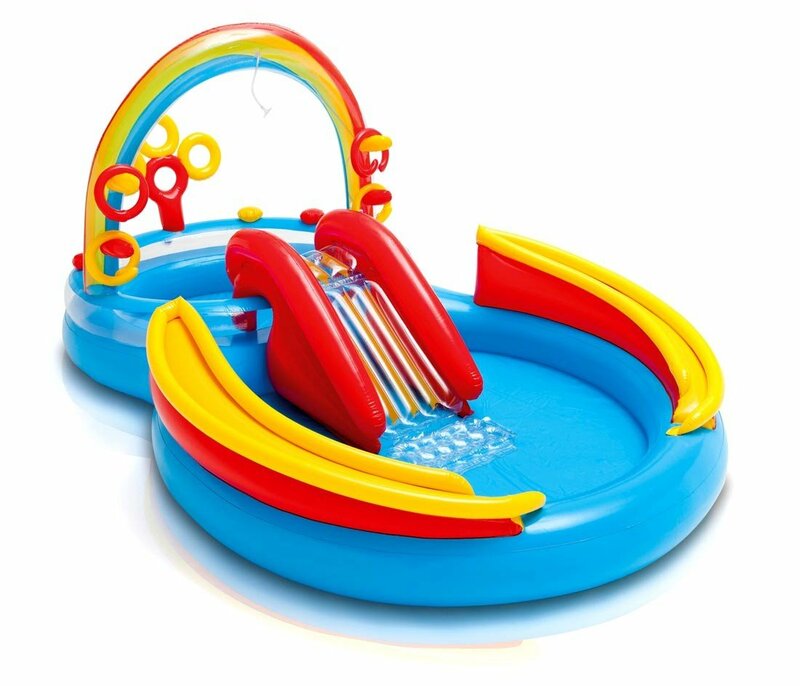 The Rainbow Ring Inflatable Play Center is a two-in-one kiddie pool and a play center. It includes a water slide and two pools for the kids to have fun with. Aside from that, it allows the children to play ball roller, ball toss, and ring toss. Lastly, it comes with a water sprayer system along the edges for additional fun, as well as to allow the kids to cool down on hot days. Intex Swim Center Family Inflatable Pool is a bit different: it doesn’t have any play centers or water slides. However, what it does have are size and water capacity. Even though this pool is a bit smaller than the Inflatable Play Center, it can contain much more water: 198 gallons, to be exact. Possibly not as great for having fun, the Family Inflatable Pool would be a better choice if you and your 6+ years old kid don’t really need all those fancy games and water slides. The larger capacity of this pool would open better opportunities of having fun with the water. If you weren’t quite impressed by the looks of the Swim Center Family Inflatable Pool, then maybe the more colorful scheme of the Intex Kiddie Pool will be more to your taste. This inflatable swimming pool for kids also has a round shape rather than rectangular, which may be the thing you want. 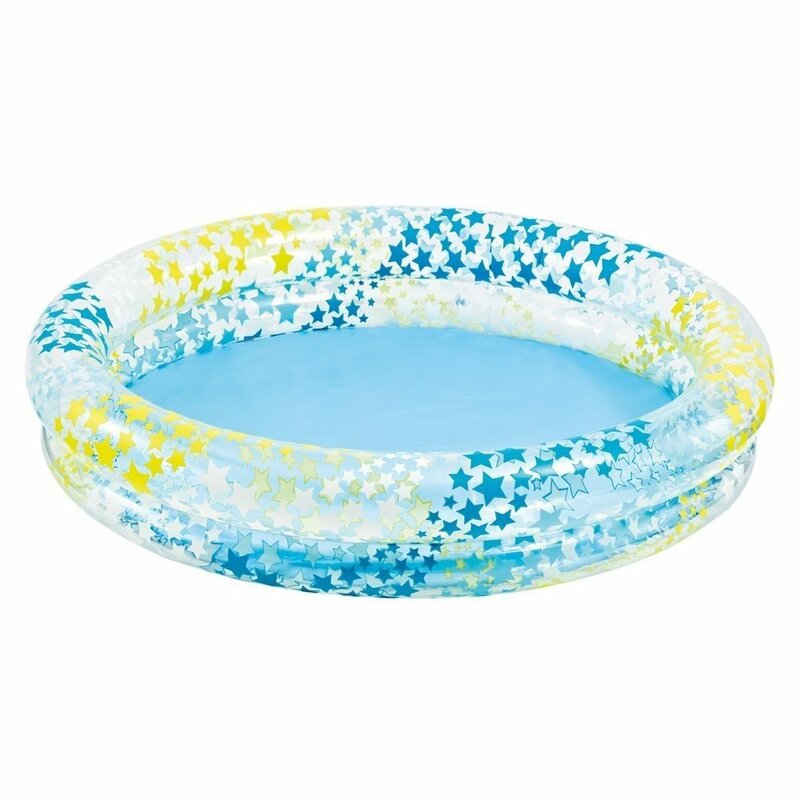 This durable vinyl kiddie pool could be a good choice if you require a more compact inflatable pool as well: measuring 58 inches in diameter and being 13 inches high, this kiddie pool is much smaller than the already examined pools. Intex Ocean Inflatable Play Center appears to have more playing room rather than accessories, though it still has such things as a slide or an inflatable ring toss game. Still, this pool has more room for the children to play with. This inflatable swimming pool is also equipped with a sprayer system for fun and cooling. And in case your kids feel bored, they could always play the ring toss or go down the inbuilt water slide. Overall, this pool looks less piled up than the play center pools, but it definitely has less entertainment capacity. If you liked Intex Swim Center Family Inflatable Pool we reviewed a bit earlier but your kids are younger than 6, maybe the Clearview Aquarium Inflatable Pool will be a good choice for you. When it comes to the features, this pool doesn’t differ too much from the Family Inflatable Pool: it doesn’t have any games or slides included. What differs the most is the quite eye-catching design of this pool, as well as its square shape with a size of 62.5 x 62.5 x 19.5 inches. 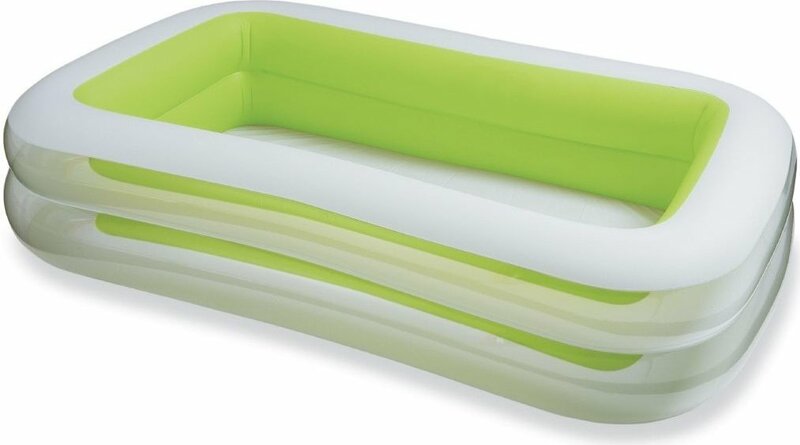 Most importantly, this inflatable pool is designed for children aged 3 or older, which could be the thing that you need. 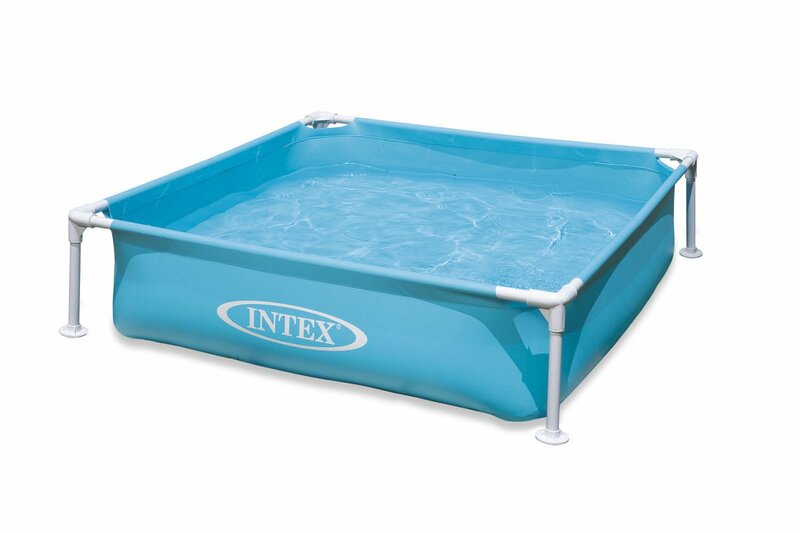 Measuring 95 x 75 x 43 inches and having 57 gallons of water capacity, Intex Dinosaur Play Center isn’t the most noteworthy pool on our reviews when it comes to size. 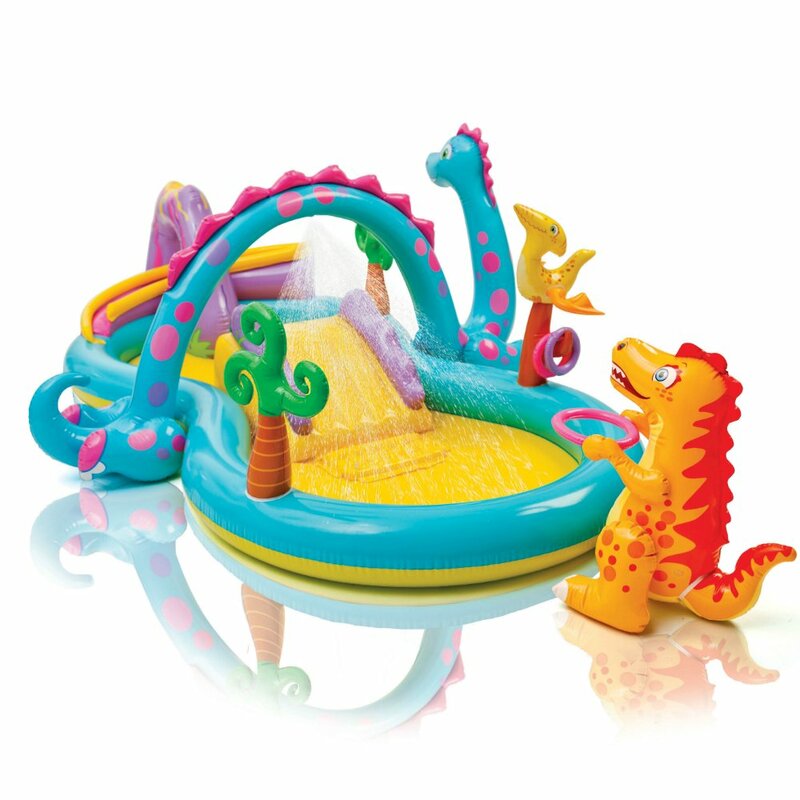 But in terms of features, the Dinosaur Play Center could interest you the most. In case not all of your kids like to be sprayed with water, you will surely appreciate the sprayer system of this pool with a palm tree sprayer and a dedicated waterfall. And to keep the kids entertained, it includes a water slide, as well as a ball toss game. If it is hot and sunny in your area, then an inflatable kiddie pool like Intex Sun Shade Inflatable Pool will probably be the best choice for you. This pool comes with a large sunshade, which is the main advantage of this pool. The sunshade can also be removed on days with not so much sun. When it comes to the size, the Sun Shade Inflatable Pool is pretty much identical to the Clearview Aquarium Inflatable Pool we examined a bit earlier. This fact makes the Sun Shade pool a great choice if you liked the Clearview pool but wished it had a sunroof. The Dinoland Play Center is quite similar to the Rainbow Ring play center we reviewed in the beginning, except that this one is dinosaur-themed. Aside from that, this pool has a calmer color scheme, which may be more to your taste than the vivid design of the Rainbow Ring pool. The Dinoland inflatable swimming pool for kids also has a number of entertaining features to occupy the children with. It comes with ball and ring toss, as well as ball roll games. Aside from that, it comes with a movable Dino Arch water spray and a water slider. If you favor entertaining over the room in kiddie pools, then this one might be the right choice. If you have one older kid or two younger children, then you will probably want something like Intex Circles Swimming Pool. This pool doesn’t have any toys included and isn’t very big, but it could be an excellent choice if nothing can entertain your kid more than water. This pool is similar to the round Kiddie Pool we examined earlier, though this one is a bit smaller, measuring 48 inches in diameter. The size won’t be an issue if your kids don’t need much room. However, make sure that your kid isn’t going to grow out of this pool any time soon before buying it. 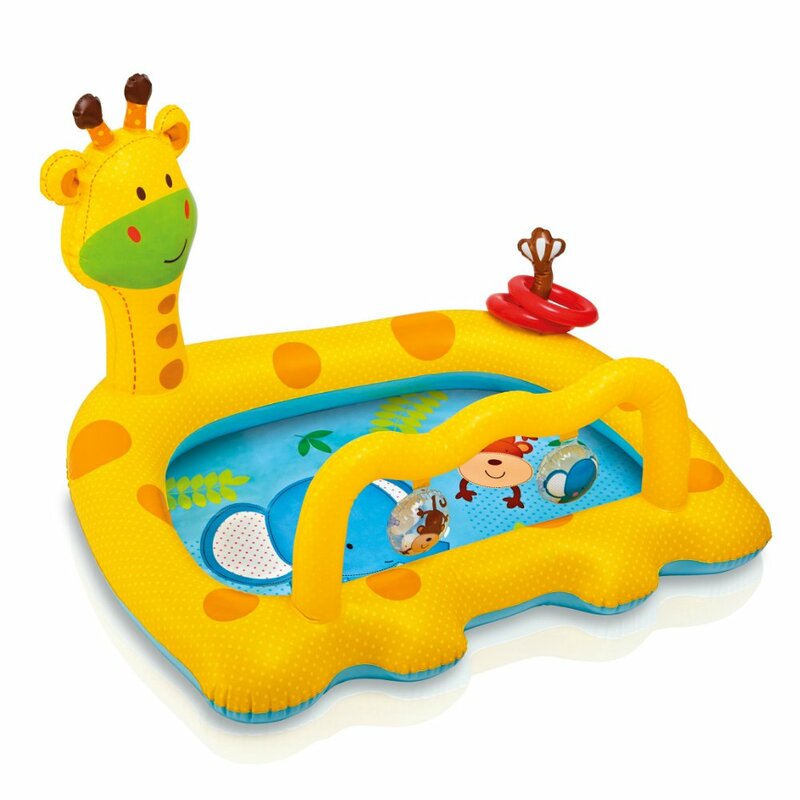 In case your kid is aged between 1 and 3 years, then maybe the Smiley Giraffee Inflatable Baby Pool would be the best kiddie pool for you. Measuring 44 x 36 x 28.5 inches, this pool won’t be big enough for older children but roomy enough for younger kids. Aside from that, this kiddie pool probably won’t be the best choice if you want a pool for 3 – 4 kids. 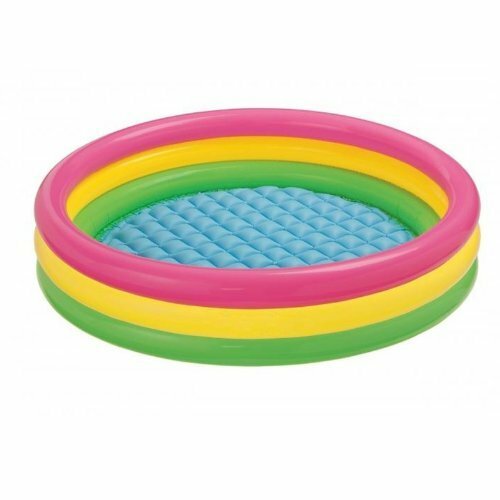 When it comes to games, this pool only includes two rings for tossing, as well as two inflatable dangling noise maker. This probably wouldn’t occupy older kids for too long, but for 1 – 3 years old children, it would be quite enough. Besides, younger kids will most likely like the adorable design of this pool. 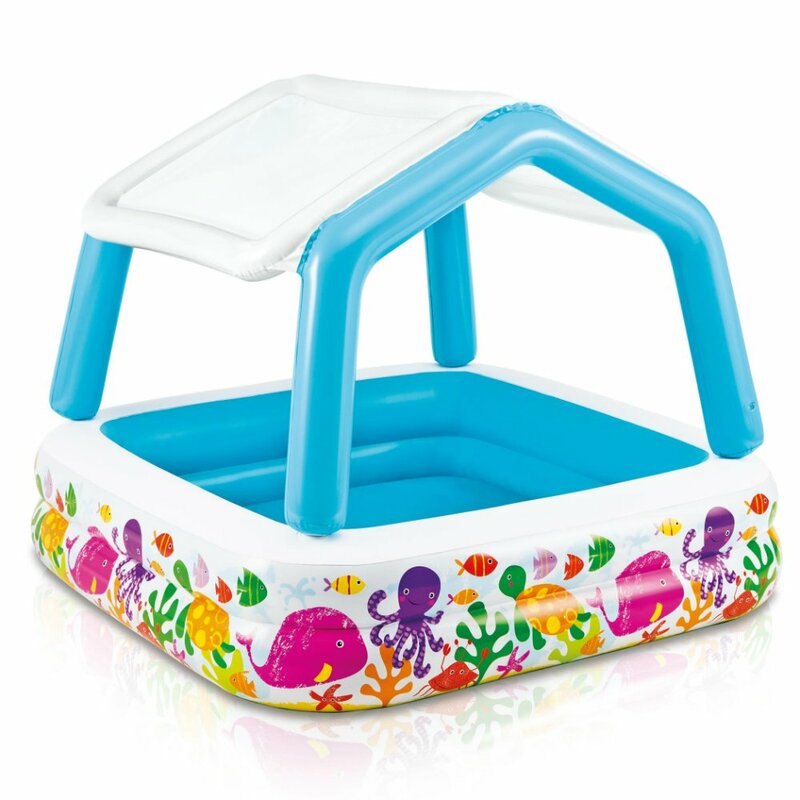 If you are looking for something like a hard plastic kiddie pool, then you might want to have a look at Intex Mini Frame Pool. This pool isn’t exactly made from plastic, to be fair. To be precise, it is comprised of thick and durable vinyl cover supported by a galvanized metal steel frame that is padded on the beams. This pool isn’t inflatable, so you won’t have to think about pumping air to set it up. You would need to think of storage space though. 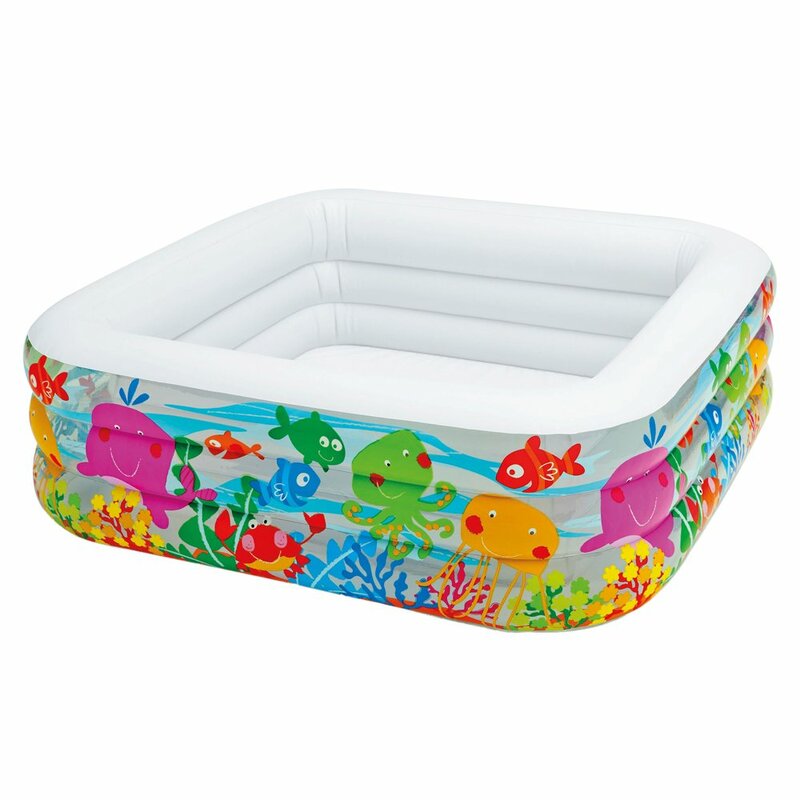 This is a basic pool, but it is a more suitable choice for 3+ years old kids who don’t really enjoy toys and favor water much more. Measuring 48 x 48 x 12 inches, this kiddie pool isn’t that big, but it will be big enough to provide 2 – 3 kids with quite enough room for play. If you are looking for a truly huge kids’ pool, then Jilong Giant Inflatable Kiddie Pool will probably be the best choice. Measuring 120 x 72 x 20 inches, it is a monster of a pool that could accommodate kids along with their parents. This pool is a bit deep though, so the recommended age for it is 6+. The water capacity of this pool is also remarkable, standing at 328 gallons. In spite of the large size, this pool appears to be fairly easy to inflate and deflate thanks to its three air chambers. While this pool doesn’t come with any games or toys, it has wide side walls for good play room for the children. 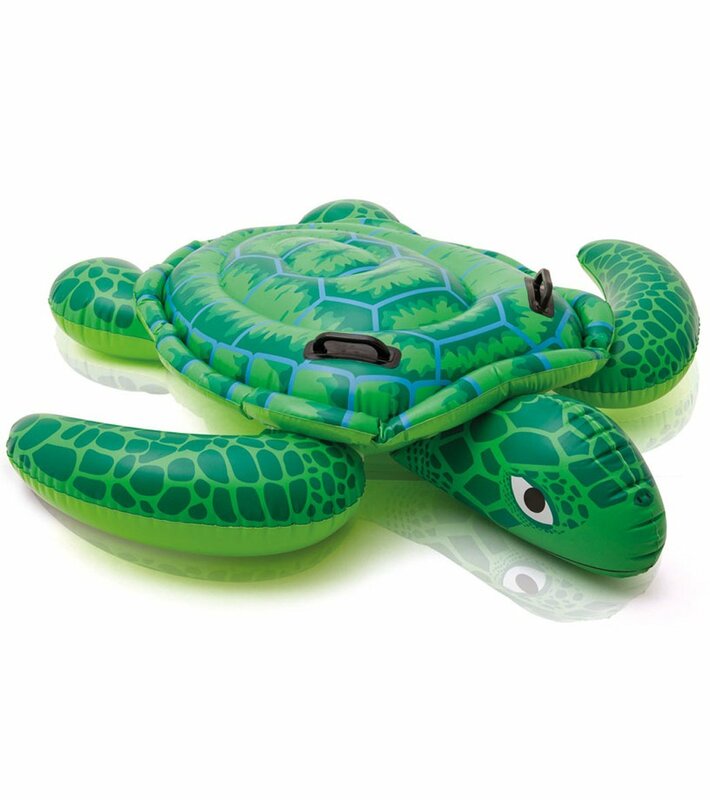 If your kids happen to like turtles, then they will probably also like the Sea Turtle Inflatable Baby Pool: this cute pool comes in the shape of a turtle. Measuring 40 x 42 inches, it isn’t very big, but since it is rated for ages 1 – 3, it should be roomy enough for 2 – 3 children. 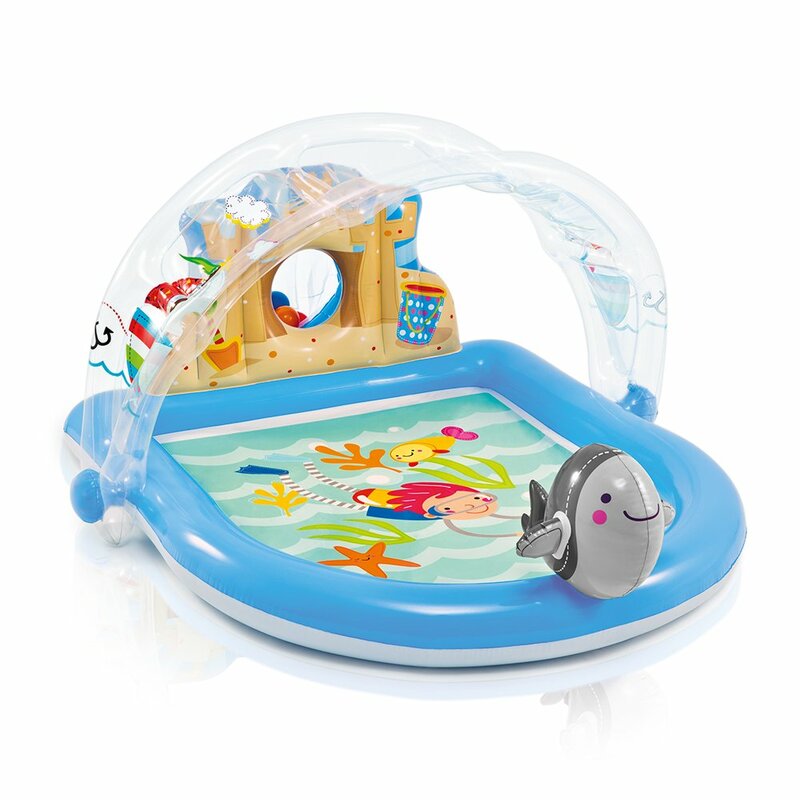 You would want to prepare toys for this baby pool since it comes with none. It includes a soft inflatable floor though for extra comfort while playing. Aside from that, it comes with a built-in partial sun shade for protection on hot and sunny days. 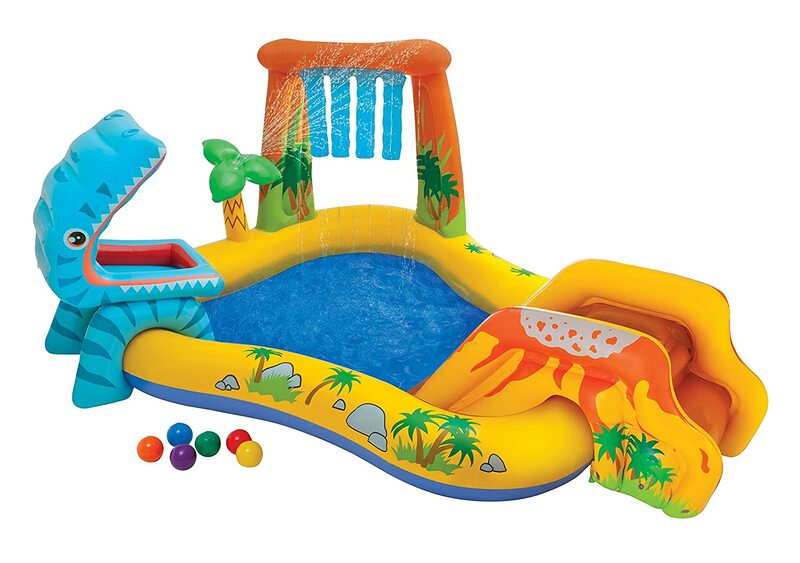 And the last inflatable swimming pool for kids on the reviews is Intex Summer Lovin’ Beach Play Center Pool. It is a play center as well, albeit maybe not as rich in features as the other play centers we reviewed. This play center pool doesn’t include things like a water slide, but it does include a ball hoop. Aside from that, it includes a removable partial sun shade. It also comes with a dolphin sprayer to keep the kids even cooler on hot days. 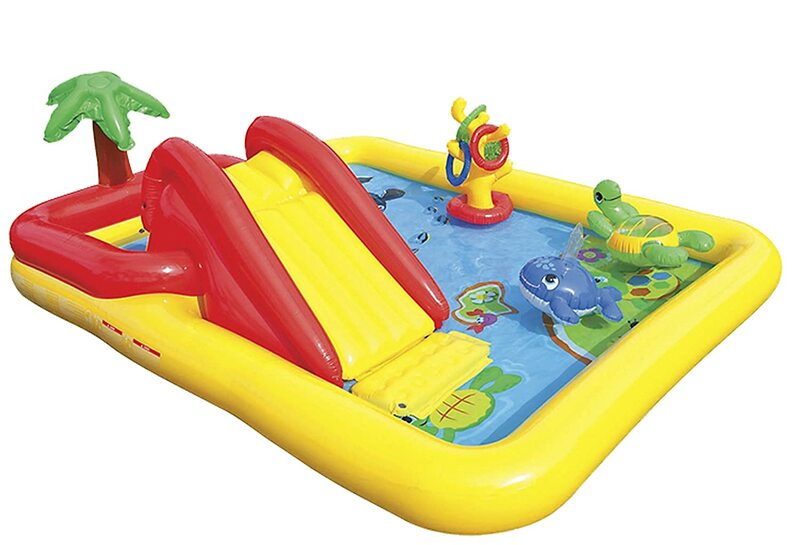 Overall, this play center pool would be a good choice for 2+ years old children. Whether you want to get a pool for 4 kids or for 1, you should carefully choose its size. There is no need to spend money on a pool that is too big for your kids. Likewise, you should avoid small pools that won’t be able to provide your kid with enough room. The shape of the pool is also rather important. If the pool will be standing somewhere out in the open, you don’t really need to worry about the shape. But if you will be putting it next to a wall or in a relatively confined area, then you might want to watch out for odd-shaped pools with inflatable castles, slides, and other additional features. Needless to say, you don’t want to spend money and only use the kiddie pool a couple of times. Aside from that, durability is a matter of safety as well. Make sure to look for a pool made from quality high-gauge vinyl or PVC, which means that the pool is thicker. Avoid cheap plastic that may get hot and possibly even melt on hot days. Safety is of utmost importance in kiddie swimming pools. First of all, you need to follow all the safety instructions and warnings when using the pool. However, when selecting a pool, you need to make sure that it will be safe for your kids and won’t suddenly collapse. To prevent this from happening, look for a pool that is wider at the base rather than at the top. Aside from the aforementioned features, you might also want to consider some other things. Kiddie pools come with a variety of additional accessories like water slides, ring and ball toss games, sunshades, or sprayer systems. Keep your needs in mind when looking for such features: for example, if you need to protect your child from the sun, you would need to get a pool with a sunshade. Learn about the children’s health condition from their parents. Don’t allow a child who is vomiting or ill with diarrhea to bathe in the pool. Give the children a soap shower or bath before they use the pool. Make sure to remind the children to avoid getting pool water in their mouths or swallowing it. Keep an eye out for feces in the pool or children with dirty diapers. In case you spot one of those, clear the pool of children, empty the water, and clean the pool. Once the pool is dry after cleaning, leave it in the sun for four hours at least. Empty the pool regularly. Larger pools that can’t be drained regularly must have appropriate filtration and disinfection systems that meet the same requirements as full-size pools do. Clean the pool and leave it to dry. Once it is completely dry, leave it out in the sun for a minimum of four hours. Playing with water in the summer is fun and cooling, but remember that water is a dangerous thing. When choosing an inflatable kiddie pool, you must make sure that it will be safe for your kid. Make sure to get a good, durable pool, preferably with a sunshade. Pay attention to age ratings as well. Aside from that, remember to watch the children playing in the pool at all times. Next articlePool Pumps Reviews: Our In Depth Guide!